More and more applications that we are responsible to automate certain actions on our phone so as not to have to worry about it. 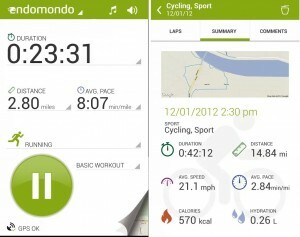 Tasker is an application for excellence in terms of possibilities is concerned, but it is also more complex to use. Sometimes we are interested in are certain aspects that enable us leave aside some phones,simple things that require few actions like putting the phone in silent or restrict calls at certain times. True to put the phone in silent manually does not involve too much work, but I assure you that I more than once I forgot to enter class … And sure I am not the only one. Agent is an application that is not new but has become available in Google Play, and allows us to monitor our phone 5 things to focus on our things. 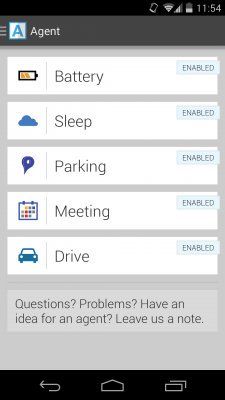 The categories are Battery, Sleeping, parking location, drive mode and meeting mode. The first one allows us to change the phone settings depending on the battery level is us , in order to save the most of those last minutes of life. The “main” activation is restricted to the battery level we indicate, we establish other aspects not activate if phone is charging or is on the screen at the time. As for options, allowing us to lower the brightness is at a certain intensity, disable automatic synchronization and disable bluetooth. The second category is responsible for silencing the phone when we go to sleep , but it works in a rather peculiar way. To begin, the basics are the times we want to change, and allows us to restrict incoming calls (adding exceptions), allow calls if recurring in less than 5 minutes, turn off synchronization in BT, send a text message or select days, but it has a nice option, which is that once we enter the slot, wait X time to verify that there has been no activity on the phone . That is, if our times are from 23 to 07, but at 23 we are still using the phone, not activate until X time elapsed since we stopped using it. The option Parking can come good drivers, because what it does is to detect that we have stopped the vehicle after it has been driving (looks based on speed positioning) and we disconnect the BT car will save ‘s location, which will allow us to look back easily if we let in a lot of those big city or do not know too. The car mode allows us to change the mobile to connect to BT, this is set to silent, block calls (except those that we want), send an SMS advising that are driving us or read incoming messages. This is no mystery. And the last is, for me, the most interesting is meeting mode. 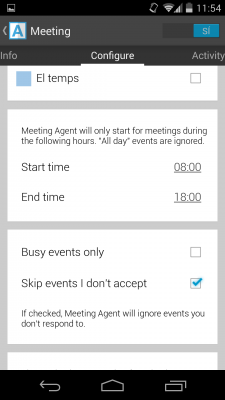 Meeting mode allows you to select from all our calendars, those who want to keep in mind when some event is triggered automatically silent mode . But it’s configurable, since we can restrict your activation events marked only as “Busy” in a certain days or times. We can also choose to mute all calls or not, or even send a message that certain messages may sound itself. You see, 5 things that are not too complicated, and can be configured in a very convenient and fast way, unlike other applications, but we can be more than enough. PS : As I told before, this app was to pay, and for those users who have paid for it in future updates will bring new features that will be free for them , but to pay for the rest. Likewise, if we are not happy with that, we can send an email to the developer for the money back.